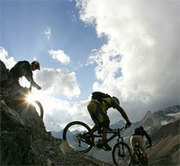 MTB Rides is dedicated to Mountain bike riding in Wantage. We are a group of mountainbikers who ride on the Ridgeway. We have rides going on each week as individual members tend to organise stuff local to them. But also we have our 'main' rides which consist of a Wednesday or a Thursday evening ride, whatever the time of year, whatever the weather! Nightriding is definitely a guilty pleasure of ours and with the advent of modern off road lighting systems we are able to go out and ride as far and as fast as we do on those warm summer's evenings. The weekend usually sees a ride on a Saturday afternoon, either local to us in Wantage or up to Watlington or Woodcote. We do have regular rides planned off further afield. Trips to the Afan Valley. One thing is for certain though, we like having fun on our bikes. So why not sign up to the site, check out the 'arrange a ride' forum and join us for a spin?